Piling is a short word of providing bored or driven pile foundation to a project. This work may be part of a complete enabling work contract or may be a special or subcontract from the main building works. When the loads of the building are heavy or may include uplift forces due to wind, earthquake, groundwater or the nature of the building, spread footings may not be enough to transfer the loads to the foundation soils and a raft or mat foundation may result in large settlements that are intolerable for the function of the building, pile foundation is the best alternative to transfer the loads to deeper layers which by that increasing the resistance capacity and decreasing expected settlements. 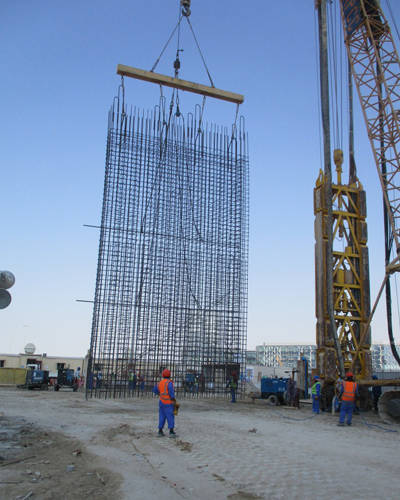 Precast concrete driven piles are rarely used in the gulf in urban areas. That is because of the driving induced vibrations and noise which may affect the surround buildings and services in addition to the annoying effects to the neighborhood. Also, the driving concrete piles into rock may damage the piles themselves. Anyhow, in some rural areas in deserts of the gulf countries they may be used satisfactorily. Steel pipes used as driven permanent piles are common in the water covered zones, sea, rivers, creeks, etc.For highrise building and building in areas with weak soils such as soils of Abu Dhabi Island the use of bored piles is highly recommended as foundations for the buildings. These are bored cast in situ reinforced concrete piles having circular cross sections. Drilling is achieved by rotary drilling rigs with suitable drilling buckets or augers. After the hole is accomplished the steel reinforcement cage is inserted in the hole and the concrete is cast afterwards in one continuous process. Continuous flight auger piles, CFA piles, are different in that the concrete is cast during pulling out the auger through a hollow stem and the reinforcement is pushed into the fresh concrete after removing the drilling equipment. CFA piles are common in low rise buildings where piles are needed. Bored piles may be from 600mm to 2400mm in diameter and may reach 40m or more in depth while CFA piles are preferred to be smaller in diameter usually do not exceed 900mm although higher diameters are possible in some cases. During the piling process stabilizing fluids may be used to keep the soil stable from collapsing into the hole such as bentonite (drilling mud) or polymers. In stable soils concreting under water is enough. If concreting is done in dry conditions it can be done by pouring into the hole but under water or drilling fluid it should be poured from the bottom to top by means of Tremie pipes. Concrete is controlled by several tests for workability, durability and strength. While on the other hands many tests are carried out on the piles to make sure of their adequate installation such as load tests and integrity tests. APCC since 1967 delivered piles of different types and lengths for a great number of projects approaching 2000 ones. Barrettes are piles of non-circular shape. There are many shapes of barrettes such as L shaped, T shaped, Cross shaped, square shaped, and the most common rectangular shaped. These are drilled by a diaphragm wall cutting machine. Barrettes are featured with their high capacity to resist vertical and lateral loads as they provide double reinforced sections to resist moments and higher surface area for the same crosssectional area compared to circular piles. In recent years barrettes are gaining more popularity and increase in demand. As APCC, the company started to deliver such type of piles during the last couple of years. Successful design and construction of these foundations and up to date technologies are keeping APCC in the leading position of piling companies in the region.